Games are among the most exciting mobile device apps, both to play and to create. The recent smash hit Angry Birds was downloaded 50 million times in its first year and is played more than a million hours every day, according to Rovio, its developer. (There is even talk of making it into a feature film!) 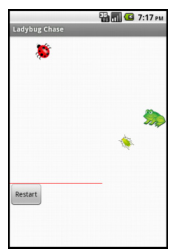 While we can't guarantee that kind of success, we can help you create your own games with App Inventor, including this one involving a ladybug eating aphids while avoiding a frog. Control a ladybug by tilting the device. View an energy-level bar on the screen, which decreases over time, leading to the ladybug's starvation. 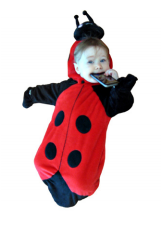 Make the ladybug chase and eat aphids to gain energy and prevent starvation. Help the ladybug avoid a frog that wants to eat it. You should work through the MoleMash app in Chapter 3 before delving into this chapter, as it assumes you know about procedure creation, random-number generation, the ifelse block, and the ImageSprite, Canvas, Sound, and Clock components. Using multiple ImageSprite components and detecting collisions between them. Detecting device tilts with an OrientationSensor component and using it to control an ImageSprite. Changing the picture displayed for an ImageSprite. Drawing lines on a Canvas component. Controlling multiple events with a Clock component. Using variables to keep track of numbers (the ladybug's energy level). Creating and using procedures with parameters. This application will have a Canvas that provides a playing field for three ImageSprite components: one for the ladybug, one for the aphid, and one for the frog, which will also require a Sound component for its "ribbit." The OrientationSensor will be used to measure the device's tilt to move the ladybug, and a Clock will be used to change the aphid's direction. There will be a second Canvas that displays the ladybug's energy level. A Reset button will restart the game if the ladybug starves or is eaten. Table 5-1 provides a complete list of the components in this app. Download the images of the ladybug, aphid, dead ladybug, and frog. You'll also need to download the sound file for the frog's ribbit. 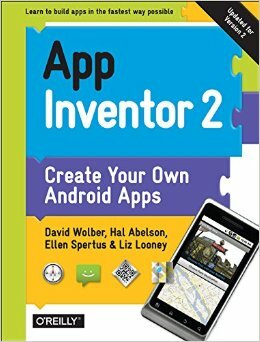 Connect to the App Inventor website and start a new project. Name it "LadybugChase" and also set the screen's title to "Ladybug Chase". Open the Blocks Editor and connect to the device. Add the images you found or created, as well as the sound file, to the Media panel. If you will be using a device, other than the emulator, you'll need to disable autorotation of the screen, which changes the display direction when you turn the device. On most devices, you do this by going to the home screen, pressing the menu button, selecting Settings, selecting Display, and unchecking the box labeled "Auto-rotate screen." In this "first-person chewer" game, the user will be represented by a ladybug, whose movement will be controlled by the device's tilt. This brings the user into the game in a different way from MoleMash, in which the user was outside the device, reaching in. While previous chapters have had you create all the components at once, that's not how developers typically work. Instead, it's more common to create one part of a program at a time, test it, and then move on to the next part of the program. In this section, we will create the ladybug and control its movement. Create a Canvas in the Component Designer, name it FieldCanvas, and set its Width to "Fill parent" and its Height to 300 pixels. Place an ImageSprite on the Canvas, renaming it Ladybug and setting its Picture property to the (live) ladybug image. Don't worry about the values of the X and Y properties, as those will depend on where on the canvas you placed the ImageSprite. The Interval property, which you can set to 10 (milliseconds) for this game, specifies how often the ImageSprite should move itself (as opposed to being moved by the MoveTo procedure, which you used for MoleMash). The Heading property indicates the direction in which the ImageSprite should move, in degrees. For example, 0 means due right, 90 means straight up, 180 means due left, and so on. Leave the Heading as-is right now; we will change it in the Blocks Editor. The Speed property specifies how many pixels the ImageSprite should move whenever its Interval (10 milliseconds) passes. We will also set the Speed property in the Blocks Editor. Add an OrientationSensor, which will appear in the "Non-visible components" section. Add a Clock, which will also appear in the "Non-visible components" section, and set its TimerInterval to 10 milliseconds. Check what you've added against Figure 5-2. 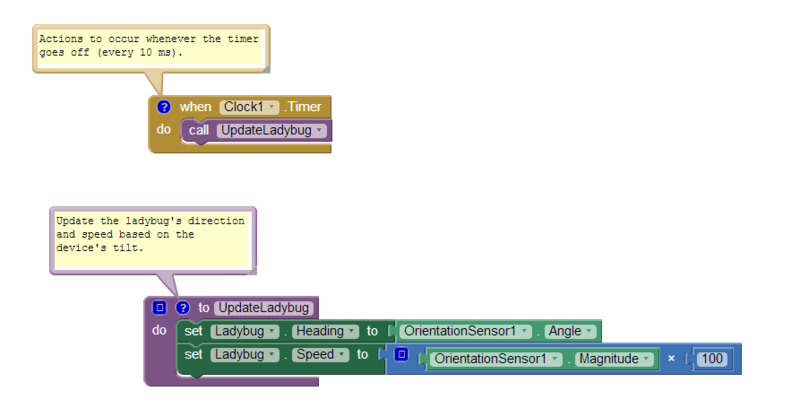 Moving to the Blocks Editor, create the procedure UpdateLadybug and a Clock1.Timer block, as shown in Figure 5-3. Try typing the names of some of the blocks (such as "Clock1.Timer") instead of dragging them out of the drawers. (Note that the operation applied to the number 100 is multiplication, indicated by an asterisk, which may be hard to see in the figure.) You do not need to create the yellow comment callouts, although you can by right-clicking a block and selecting Add Comment. Angle, which indicates the direction in which the device is tilted (in degrees). Magnitude, which indicates the amount of tilt, ranging from 0 (no tilt) to 1 (maximum tilt). Multiplying the Magnitude by 100 tells the ladybug that it should move between 0 and 100 pixels in the specified Heading (direction) whenever its TimerInterval, which you previously set to 10 milliseconds in the Component Designer, passes. Although you can try this out on the connected device, the ladybug's movement might be both slower and jerkier than if you package and download the app to the device. If, after doing that, you find the ladybug's movement too sluggish, increase the speed multiplier. If the ladybug seems too jerky, decrease it. We will display the ladybug's energy level with a red bar in a second canvas. The line will be 1 pixel high, and its width will be the same number of pixels as the ladybug's energy, which ranges from 200 (well fed) to 0 (dead). 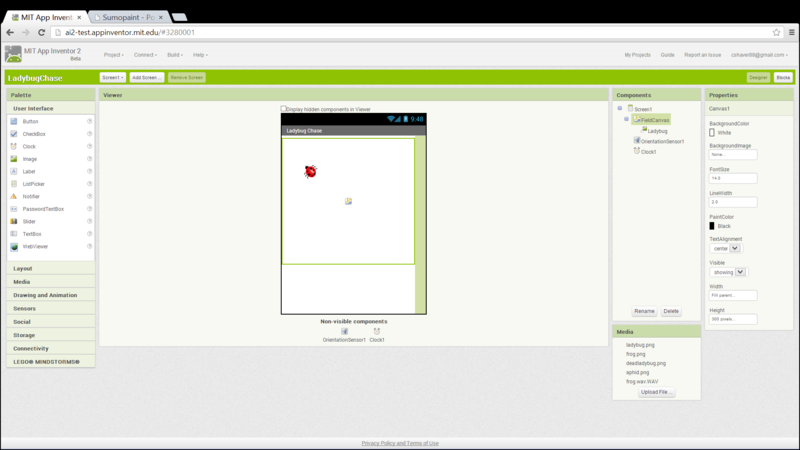 In the Designer, create a new Canvas, placing it beneath FieldCanvas and naming it EnergyCanvas. Set its Width property to "Fill parent" and its Height to 1 pixel. In the Blocks Editor, drag out an initialize global name to block. Change the text "name" to "energy". If there is a block in the socket on the right side of global energy, delete it by selecting it and either pressing the Delete key or dragging it to the trash can. Create a number 200 block (by either starting to type the number 200 or dragging a number block out of the Math drawer) and plug it into global energy, as shown in Figure 5-4. Figure 5-5 shows how creating the variable also added blocks to the My Definitions drawer to set or get the value of energy. Draw a red line from (0, 0) to (energy, 0) in FieldCanvas to show the current energy level. Draw a white line from (0, 0) to (EnergyCanvas.Width, 0) in FieldCanvas to erase the current energy level before drawing the new level. However, a better alternative is to create a procedure that can draw a line of any length and of any color in FieldCanvas. To do this, we must specify two arguments, length and color, when our procedure is called, just as we needed to specify parameter values in MoleMash when we called the built-in random integer procedure. Here are the steps for creating a DrawEnergyLine procedure, which is shown in Figure 5-6. Go to the Procedures drawer and drag out a to procedure block. 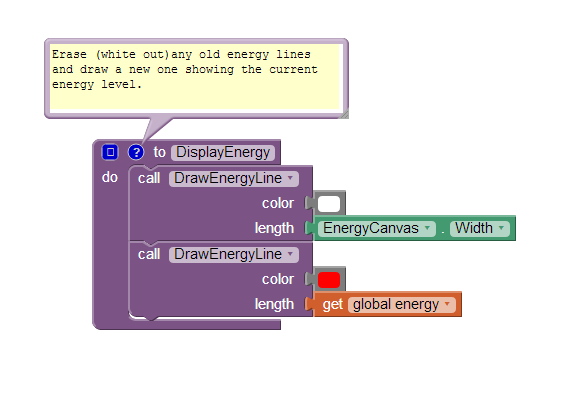 Click its name (probably "procedure") and change it to "DrawEnergyLine". Go back to the Definition drawer and drag out a name block, snapping it into the arg (short for argument) socket. Click its name and change it to "color". Repeat step 3 to add a second argument and name it "length". Fill in the rest of the procedure as shown in Figure 5-6. You can find the new color and length blocks in the My Definitions drawer. Now that you're getting the hang of creating your own procedures, let's also write a DisplayEnergyLevel procedure that calls DrawEnergyLine twice, once to erase the old line (by drawing a white line all the way across the canvas) and once to display the new line, as shown in Figure 5-7. Set the paint color to white. Draw a line all the way across EnergyCanvas (which is only 1 pixel high). Set the paint color to red. Draw a line whose length in pixels is the same as the energy value. Note. The process of replacing common code with calls to a new procedure is called refactoring, a set of powerful techniques for making programs more maintainable and reliable. In this case, if we ever wanted to change the height or location of the energy line, we would just have to make a single change to DrawEnergyLine, rather than making changes to every call to it. Unlike the apps in previous chapters, this game has a way to end: it's over if the ladybug fails to eat enough aphids or is eaten by the frog. In either of these cases, we want the ladybug to stop moving (which we can do by setting Ladybug.Enabled to false) and for the picture to change from a live ladybug to a dead one (which we can do by changing Ladybug.Picture to the name of the appropriate uploaded image). Create the GameOver procedure as shown in Figure 5-8. End the game if energy is 0. Test your app. You should be able to test this code on your device and verify that the energy level decreases over time, eventually causing the ladybug's demise. If you want to restart the application, press the "Connect to Device..." button in the Blocks Editor. Set its Picture property to the aphid image file you uploaded. Set its Interval property to 10, so, like the ladybug, it moves every 10 milliseconds. Set its Speed to 2, so it doesn't move too fast for the ladybug to catch it. Don't worry about its X and Y properties (as long as it's not on top of the ladybug) or its Heading property, which will be set in the Blocks Editor. By experimenting, we found it worked best for the aphid to change directions approximately once every 50 milliseconds (5 "ticks" of Clock1). One approach to enabling this behavior would be to create a second clock with a TimerInterval of 50 milliseconds. However, we'd like you to try a different technique so you can learn about the random fraction block, which returns a random number greater than or equal to 0 and less than 1 each time it is called. Create the UpdateAphid procedure shown in Figure 5-10 and add a call to it in Clock1.Timer. Whenever the timer goes off (100 times per second), both UpdateLadybug (like before) and UpdateAphid are called. The first thing that happens in UpdateAphid is that a random fraction between 0 and 1 is generated—for example, 0.15. If this number is less than 0.20 (which will happen 20% of the time), the aphid will change its direction to a random number of degrees between 0 and 360. If the number is not less than 0.20 (which will be the case the remaining 80% of the time), the aphid will stay the course. The next step is having the ladybug "eat" the aphid when they collide. Fortunately, App Inventor provides blocks for detecting collisions between ImageSprite components, which raises the question: what should happen when the ladybug and the aphid collide? You might want to stop and think about this before reading on. Increases the energy level by 50 to simulate eating the tasty treat. Causes the aphid to disappear (by setting its Visible property to false). Causes the aphid to stop moving (by setting its Enabled property to false). Causes the aphid to move to a random location on the screen. (This follows the same pattern as the code to move the mole in MoleMash). Check that your blocks match Figure 5-11. If you had other ideas of what should happen, such as sound effects, you can add those too. Whenever EatAphid is called, it adds 50 to the variable energy, staving off starvation for the ladybug. Next, the aphid's Visible and Enabled properties are set to false so it seems to disappear and stops moving. Finally, random x and y coordinates are generated for a call to Aphid.MoveTo so that, when the aphid reappears, it's in a new location (otherwise, it will be eaten as soon as it reemerges). Figure 5-12 shows the code to detect collisions between the ladybug and the aphid. Note that when you add a condition to the "and" block, a new test socket appears. When the ladybug collides with another ImageSprite, Ladybug.CollidedWith gets called, with the parameter "other" bound to whatever the ladybug collided with.Right now, the only thing it can collide with is the aphid, but we'll be adding a frog later. We'll use defensive programming and explicitly check that the collision was with the aphid before calling EatAphid. There's also a check to confirm that the aphid is visible. Otherwise, after an aphid is eaten but before it reappears, it could collide with the ladybug again. Without the check, the invisible aphid would be eaten again, causing another jump in energy without the user understanding why. Note. Defensive programming is the practice of writing code in such a way that it is still likely to work even if the program gets modiis not strictly necessary because the only thing the ladybug can currently collide with is the aphid, but having the check will prevent our program from malfunctioning if we add another ImageSprite and forget to change Ladybug.CollidedWith. Programmers generally spend more time fixing bugs than writing new code, so it is well worth taking a little time to write code in a way that prevents bugs. To make the aphid eventually reappear, you should modify UpdateAphid as shown in Figure 5-13 so it changes the aphid's direction only if it is visible. (Changing it if it's invisible is a waste of time.) If the aphid is not visible (as in, it has been eaten recently), there is a 1 in 20 (5%) chance that it will be reenabled—in other words, made eligible to be eaten again. If the aphid is visible (which will be the case unless it was just eaten), UpdateAphid behaves as we first wrote it. Specifically, there is a 20% chance of its changing direction. If the aphid is not visible (was recently eaten), then the "else-do" part of the ifelse block will run. A random number is then generated. If it is less than .05 (which it will be 5% of the time), the aphid becomes visible again and is enabled, making it eligible to be eaten again. Because UpdateAphid is called by Clock1.Timer, which occurs every 10 milliseconds, and there is a 1 in 20 (5%) chance of the aphid becoming visible again, the aphid will take on average 200 milliseconds (1/5 of a second) to reappear. As you may have noticed from testing the app with your new aphid-eating functionality, the game really needs a Restart button. (This is another reason why it's helpful to design and build your app in small chunks and then test it—you often discover things that you may have overlooked, and it's easier to add them as you progress than to go back in and change them once the app is "complete.") In the Component Designer, add a Button component underneath EnergyCanvas, rename it "RestartButton", and set its Text property to "Restart". Set the energy level back to 200. Reenable the aphid and make it visible. Reenable the ladybug and change its picture back to the live ladybug (unless you want zombie ladybugs!). Right now, keeping the ladybug alive isn't too hard. We need a predator. Specifically, we'll add a frog that moves directly toward the ladybug. If they collide, the ladybug gets eaten, and the game ends. The first step to having the frog chase the ladybug is returning to the Component Designer and adding a third ImageSprite—Frog—to FieldCanvas. Set its Picture property to the appropriate picture, its Interval to 10, and its Speed to 1, since it should be slower-moving than the other creatures. Figure 5-15 shows UpdateFrog, a new procedure you should create and call from Clock1.Timer. 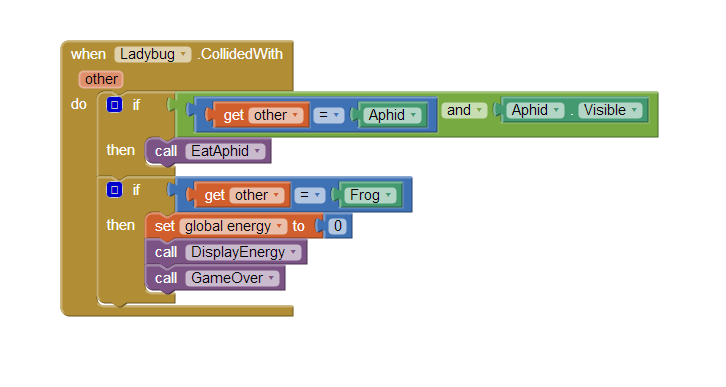 We now need to modify the collision code so that if the ladybug collides with the frog, the energy level and bar goes to 0 and the game ends, as shown in Figure 5-16. The variable energy goes down to 0, since the ladybug has lost its life force. DisplayEnergy is called, to erase the previous energy line (and draw the new—empty—one). The procedure we wrote earlier, GameOver, is called to stop the ladybug from moving and changes its picture to that of a dead ladybug. RestartButton.Click already has code to replace the picture of the dead ladybug with the one of the live ladybug. Now you need to add code to move the live ladybug to a random location. (Think about what would happen if you didn't move the ladybug at the beginning of a new game. Where would it be in relation to the frog?) Figure 5-17 shows the blocks to move the ladybug when the game restarts. The only difference between this version of RestartButton.Click and the previous version is the Ladybug.MoveTo block and its arguments. The built-in function random integer is called twice, once to generate a legal x coordinate and once to generate a legal y coordinate. While there is nothing to prevent the ladybug from being placed on top of the aphid or the frog, the odds are against it. Test your app. Restart the game and make sure the ladybug shows up in a new random location. In the Component Designer, add a Sound component. Set its Source to the sound file you uploaded. Make the device vibrate when an aphid is eaten by adding a Sound1.Vibrate block with an argument of 100 (milliseconds) in EatAphid. Make the frog ribbit when it eats the ladybug by adding a call to Sound1.Play in Ladybug.CollidedWith just before the call to GameOver. Currently, the frog and aphid keep moving after the game has ended. Prevent this by setting their Enabled properties to false in GameOver and back to true in RestartButton.Click. Display a score indicating how long the ladybug has remained alive. You can do this by creating a label that you increment in Clock1.Timer. Add ambiance with a background image and more sound effects, such as nature sounds or a warning when the ladybug's energy level gets low. Have the game get harder over time, such as by increasing the frog's Speed property or decreasing its Interval property. Technically, the ladybug should disappear when it is eaten by the frog. Change the game so that the ladybug becomes invisible if eaten by the frog but not if it starves to death. Replace the ladybug, aphid, and frog pictures with ones more to your taste, such as a hobbit, orc, and evil wizard or a rebel starfighter, energy pod, and Imperial starfighter. You can have multiple ImageSprite components (the ladybug, the aphid, and the frog) and can detect collisions between them. The tilt of the device can be detected by the OrientationSensor, and the value can be used to control the movement of a sprite (or anything else you can imagine). 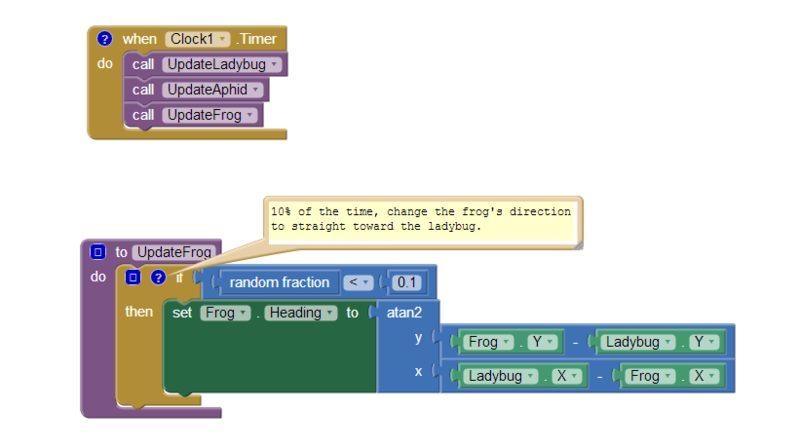 A single Clock component can control multiple events that occur at the same frequency (changes in the ladybug's and frog's directions), or at different frequencies, by using the random fraction block. For example, if you want an event to occur approximately one-fourth (25 percent) of the time, put it in the body of an if block that is only executed when the result of random fraction is less than .25. You can have multiple Canvas components in a single app, which we did to have both a playing field and to display a variable graphically (instead of through a Label). 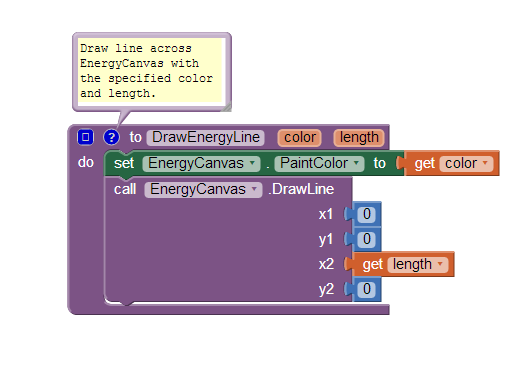 User-defined procedures can be defined with parameters (such as "color" and "length" in DrawEnergyLine) that control the behavior, greatly expanding the power of procedural abstraction. Another component useful for games is Ball, which only differs from ImageSprite in having the appearance of a filled circle rather than an arbitrary image.